Enemy AI: The art of making interactive computer-controlled game characters! Here's a tutorial about how to do it! First off, I'm not talking about the movie AI. Although, it was a good movie. No, I'm talking about AI from a gaming point of view! AI stands for Artificial Intelligence. Basically, this refers to the characters in games which the computer controls to either help you or harm you depending on the game and its circumstances. However, seeing as the title of this article is “Enemy AI”, I will only be talking about the harming you aspect of the AI. However, the same methods can be applied to computer players that are on your side as well. 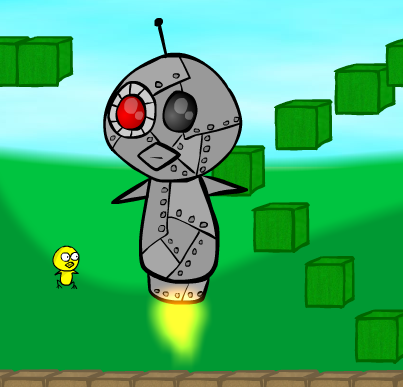 As an example of artificial intelligence, take the boss from Stage Two of Gawkgame. So, what does he react to? I like to make flowcharts as they make the coding process extremely easy. 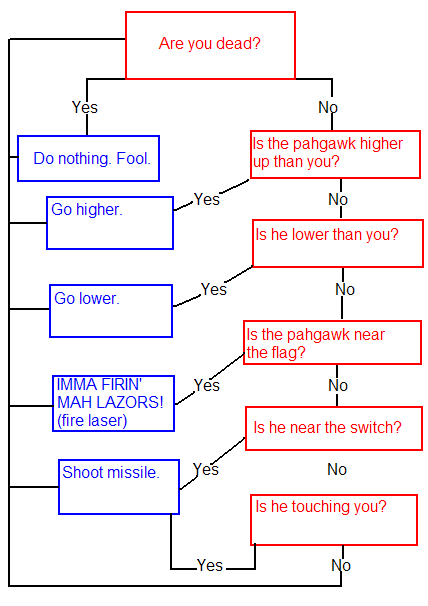 So, here's the chart I made for the robo-gawk. So as you can see, there isn't all that much to program. So, here's this flowchart translated into ActionScript2, where the actions are to be applied on the robo-gawk's MovieClip. //Is the Pahgawk lower than you? //Is the Pahgawk higher than you? //Is the Pahgawk touching the invisible "flagarea" movieclip that is basically a square with the flag in its center? //Did Pahgawk hit the laser? //is Pahgawk near the invisible "switcharea" that is around the switch? //is the missile to Pahgawk's right? //Is the missile to the Pahgawk's left? //this is all pretty much the same thing, but with the vertical axis instead of the horizontal one. //Did Pahgawk hit the missile? //Resets Pahgawk's coordinates to the starting position. 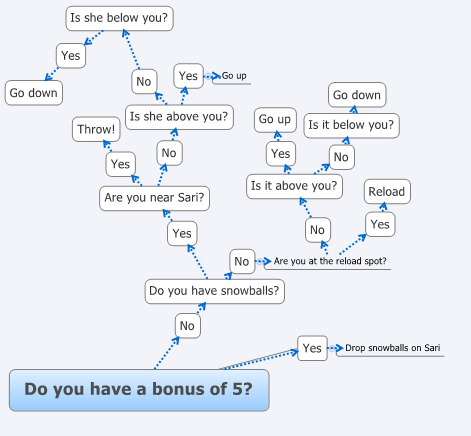 David from the Snowball Fight game's flowchart. Basically. Now, obviously, this is only the basic stuff shown here. There is also a lot more. Like, you can't just type “throw” into Flash and expect it to know what that means. But this is how one goes about planning for an artificially intelligent character for a game. In case you are wondering, the above picture was created using Xmind, a flowchart or brainstorming program. I highly recommend it if you don't happen to have a notebook and paper next to you or if you want to be able to go back and edit/add new bubbles later on. Hopefully this helped for anyone programming games!